Some of the most well-known and well-respected cultural figures of our time enter into intimate and illuminating conversation about their personal beliefs, about belief itself, about religion, and about God. 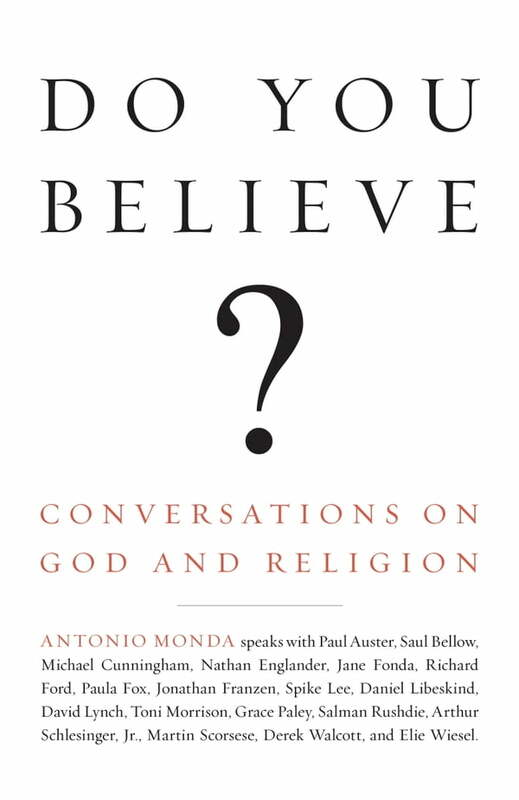 Antonio Monda is a disarming, rigorous interviewer, asking the most difficult questions (he often begins an interview point blank: “Do you believe in God?”) that lead to the most wide-ranging conversations. An ardent believer himself, Monda talks both with atheists (asked what she feels when she meets a believer, Grace Paley replies: “I respect his thinking and his beliefs, but at the same time I think he’s deluded”) and other believers, their discussion ranging from personal images of God (Michael Cunningham sees God as a black woman, Derek Walcott as a wise old white man with a beard) to religion’s place in American culture, from the afterlife to the concepts of good and evil, from fundamentalism to the Bible. And almost without fail, the conversations turn to questions of art and literature. Toni Morrison discusses Virginia Woolf and William Faulkner, Richard Ford invokes Wallace Stevens, and David Lynch draws attention to the religious aspects of Bu–uel, Fellini...and Harold Ramis's Groundhog Day. Informal, revealing, unexpected, Do You Believe? is a captivating and thought-provoking meditation how faith, in all its facets, remains profoundly relevant for and in our culture.